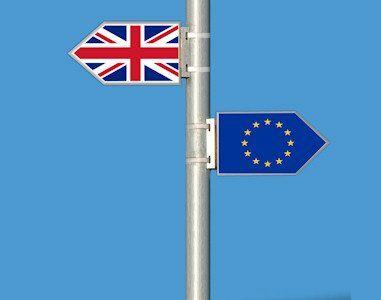 Despite a supposed ‘pause’ in the government’s hostile environment agenda, in the wake of the Windrush scandal, much of its discriminatory processes and procedures remain in place. 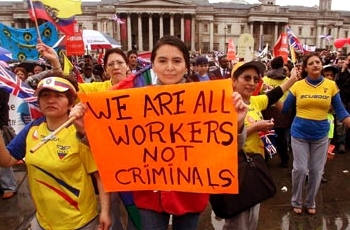 The notorious Right to Work checks are still mandatory, and heavy-handed immigration raids, which have long been used to harass and strike fear in migrant communities, continue to epitomise the Home Office’s unabatedly aggressive approach to ‘cracking down’ on undocumented labour. A recent example came on July 5, when immigration officers conducted a brutal raid on businesses in London’s Chinatown. 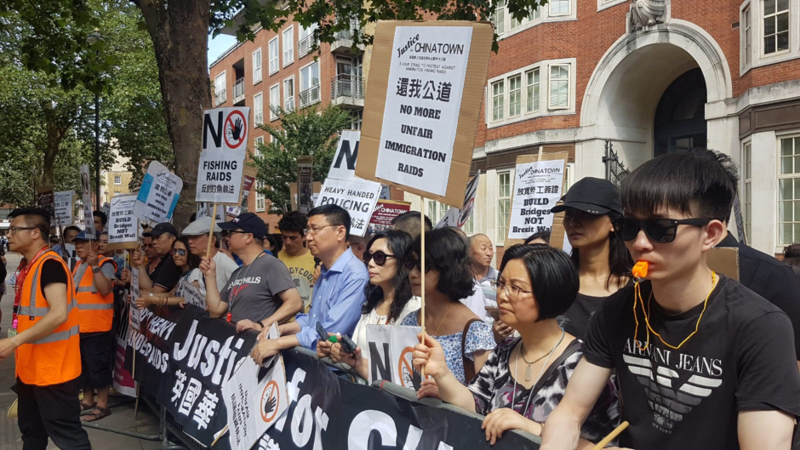 Video footage emerged of an elderly, deaf and mute woman allegedly manhandled and nearly run into by an immigration enforcement van after she tried to protest the arrest of her relative, according to the London Chinatown Chinese Association (LCCA) and others present. In response to the raid’s violence and to protest increased targeting by immigration enforcement, businesses and allies staged a 5-hour shut-down of Chinatown on Tuesday afternoon, as well as a 500-strong march to submit a collective letter of demands to the Home Office. The ‘Justice for Chinatown’ strike and protest was organised by the LCCA and supported by the Chinese Information and Advice Centre and the Monitoring Group. 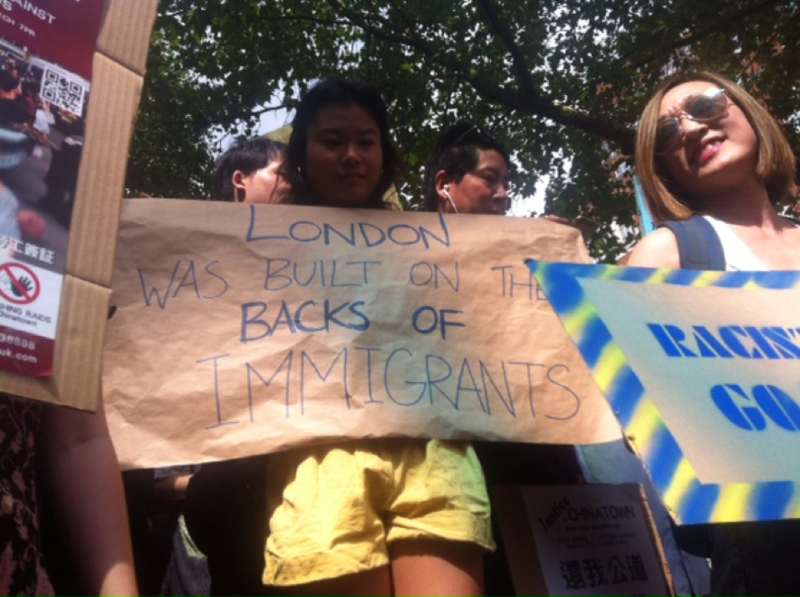 Although the demonstration focused on immigration raid activity in London’s Chinatown, allies from the Chinese communities in Brighton, Liverpool, Manchester and Scotland also joined the protest. We are striking to demonstrate the frustration and anger of the community towards the increasing and unfair immigration raids on a growing number of restaurants. 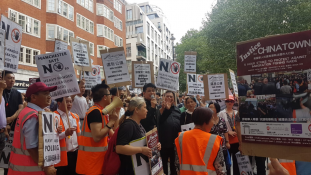 Speaking to the crowds gathered outside the Home Office, Wu expressed disappointment and anger that the raid almost immediately followed a meeting with the Home Office as part of attempts to initiate dialogue on the issue of undocumented labour. Wu called on the Home Office to engage with the community instead of pursuing a repressive, enforcement-led approach. In Britain, the East Asian and the Chinese community is often described as ‘the silent minority’ or the ‘model minority’, and the problematic thing with that representation is that it implies we can be stepped all over, and that people who are in positions of power think that they do not need to listen to our concerns. We want to show the Home Office Chinese people are not the ‘silent community’ anymore. Do not take us for granted. Do not abuse us with your power. A letter signed by the Chair of the LCCA, CT Tang, the Chair of the Chinese Information and Advice Centre, Edmond Yeo, and by Bobby Chan of The Monitoring Group, was delivered to a representative of the Home Office. The letter reaffirms the right of people in the Chinatown to be treated with respect and dignity and asserts that local businesses and workers will “not tolerate aggressive or discriminatory behaviour from (immigration) enforcement agencies.” It also asks for a review of current immigration policy in the wake of the labour shortages facing the catering industry. There are serious concerns about the legality of the fishing raid: we now know the immigration officers left a notice (under Section 179 of the Licensing Act) in the targeted restaurant without explaining what it meant. Needless to say, the Chinese community in London is not the only one affected by immigration raids. It is MRN’s view that raids are inherently brutal, often discriminatory in their targetting and impact, and are part of an unjustified criminalisation of undocumented migrant workers. A young Sudanese man in Newport recently died trying to flee a raid on the carwash where he worked. MRN is coordinating a newly-formed network of partners and lawyers to challenge immigration raids, as part of its London Project. If you want to know more, contact Jilna: [email protected]. The network is currently offering support to a restaurant affected by the raid in Chinatown. For more information on knowing your rights in relation to Right to Work and immigration raids, please see MRN’s Know Your Rights Guide for migrants and information by the Anti-Raids Network (available in multiple languages). If you’d like an in-depth understanding of how immigration enforcement works, see this report by Corporate Watch.